The next morning, we had already realized that the canyon walls are so steep that there was no point in getting up super early for the dawn and sunrise. 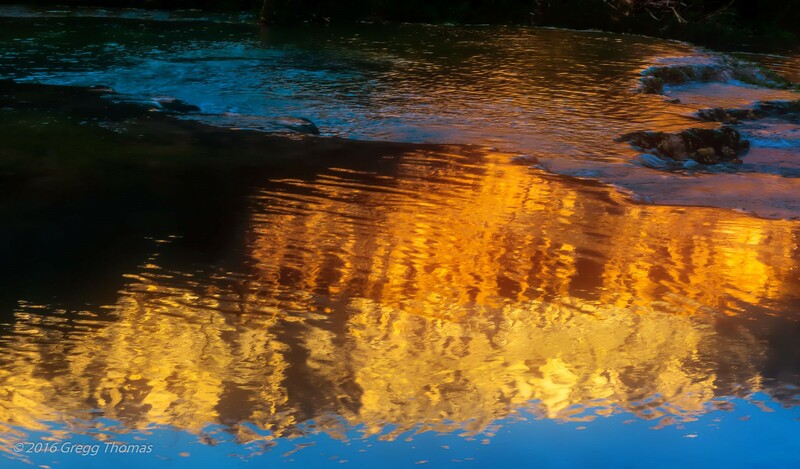 As we hiked down the canyon again on our way to Havasu Falls, Bryan noticed the reflections in the pools of the creek, so we began to play with the water and the light of the reflections from the red cliffs. 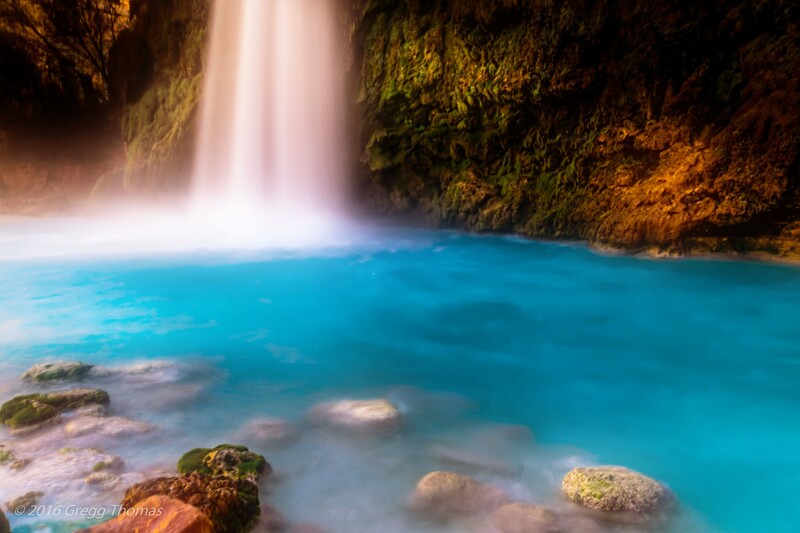 The pictures below are of Lower Navajo Falls. This is another breathtaking waterfall, surrounded by incredible red canyon walls in every direction. Along this stretch of the river, there were Pied Billed Grebes, Mallards, and even some Coots. I didn’t expect these types of birds in this area, but this turned out to be an oasis in the midst of the desert. 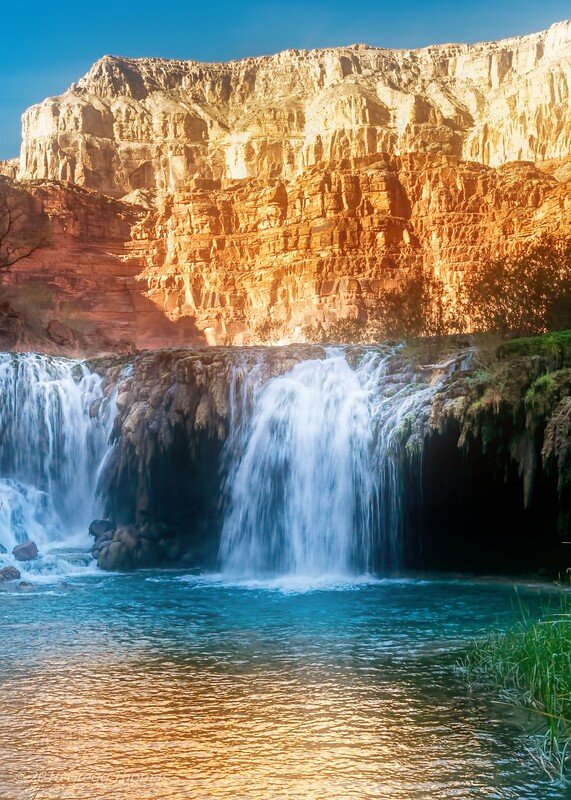 After playing around with the light in the reflecting pools around Little Navajo Falls, Bryan and I hiked a couple miles down to Havasu Falls again. This time, however, we explored the area at the top of the falls, to the right of the trail, and it turned out that it’s possible to get within mere feet of where the water begins its 200 foot plunge over the cliff. 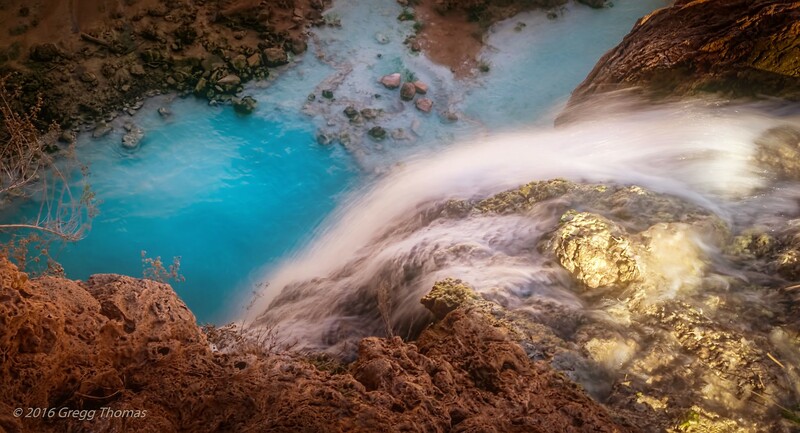 The picture below is the first of two shots I took of the bottom of Havasu Falls as the water poured into the pool below. 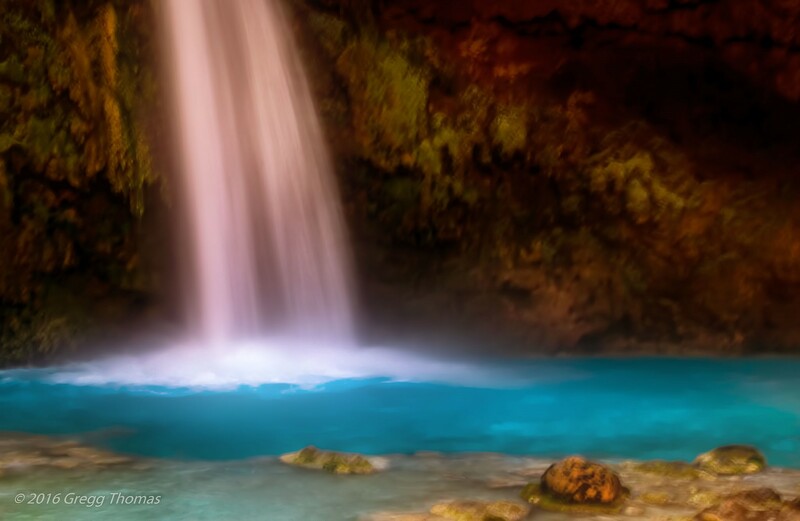 I’m not sure it’s possible to truly capture the power and beauty of what I saw, but this shot is a blurred on purpose with a slow shutter speed to convey the calming effect of the area, the amazing color of the blue water, and the power of the waterfall itself. 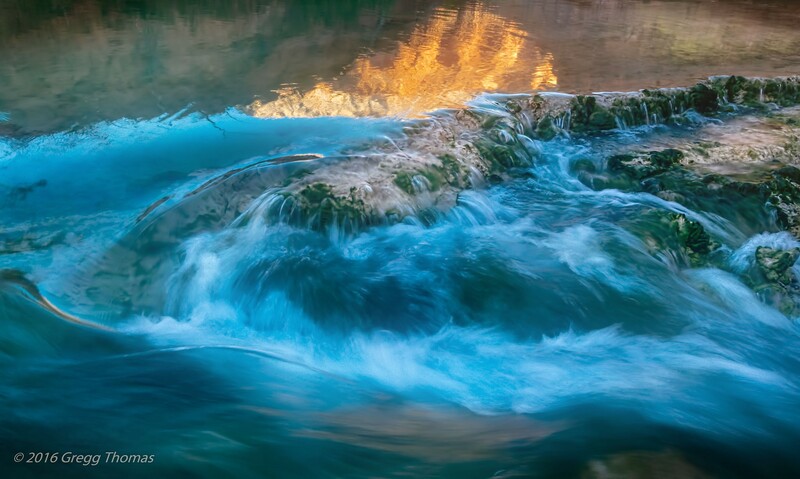 This is the second of two shots I took of the bottom of Havasu Falls on our second (and last) day in the area. 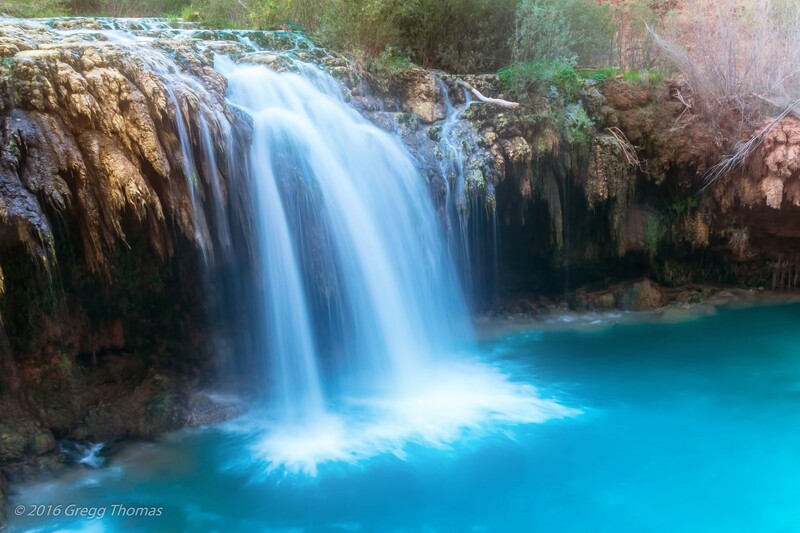 I think it’s possible to have stayed here for hours with these falls, looking at the blue water, listening to the water’s roar at the bottom of the waterfall, and staring at the light patterns on the pool. I’m not sure if either of these two shots captured the beauty of this view we had on that day. Finally we had to start hiking out. As we reached the village and were about to go into the small store for some Gatorade and water, an older Supai Indian with a weathered face walked up to us. He asked Bryan, “You hiking out today?” Bryan replied with a grin, “We sure are.” The old man grunted, cocked his head a bit, and said, “Sun goes down at four. Long hike ahead of you. You sure you hiking out today?” Bryan laughed again and said, “We’re heading out now, so we should make it by 4 pm.” The Indian looked at us, looked down at the ground, grunted, waved goodbye, and said, “Good luck.” Bryan and I have laughed at this many times since. What we must have looked like to this Indian that had grown up in this area as a young boy! His grunt was one of doubt. As we began the hike out, Bryan set a pace faster than the first day, which had been all downhill. We had plenty of rest stops, but the last two miles is where we had to gain 4,000 feet back in elevation, and my legs were spent. Bryan stayed with me and we finally reached the top. If I have to do it again, I agree with Bryan… We’ll have to spend more time in the canyon, we may just hop on the helicopter for the ride out, and cold beer waiting in the car would be just the best of final touches! I’ll have to go back one day and try that plan out.